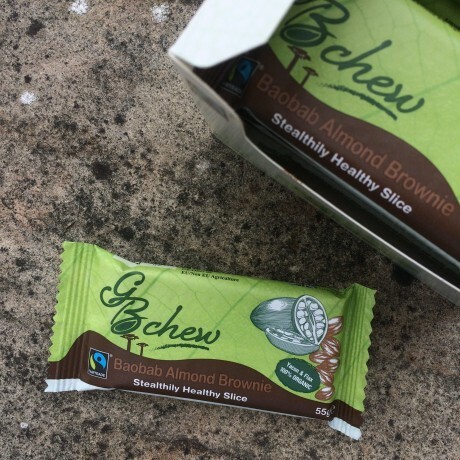 A rich fudgy sensation, with an almond, cacao crunch and the unique caramel flavour of the baobab powder. BAOBAB is a 100% natural and organic African superfruit. It's higher in calcium than milk, a rich source of Vitamin C and fibre. It has more antioxidants than any fruit, supporting immune function, energy release and skin health. ALMONDS are packed with protein, and an excellent source of vitamin E, magnesium, and fibre. Almonds are filled with minerals such as magnesium, copper, potassium, calcium, phosphorus and iron, and also B vitamins. Dates, Milled Brown Flaxseeds (13%), Cocoa Powder, Almonds (8%), Cocoa Nibs, Yacon Root Syrup (6%), Sunflower Oil, Baobab Powder (2%).